Any discussion on Church Growth has to look at the Great Commission. 1) If using the Great Commission as a church growth verse, one must realize that Jesus is the Source and Standard governing and driving church growth. Jesus, the Head of the Church, is the One commissioning people to go and make disciples so we must get our motivation and direction from Him. We have already looked at how neglecting this important observation can have detrimental effects. If you haven’t already read the following pages, please do so for added understanding. Do people in your church truly understand that outreach is more than a program or leadership initiative? 2) If using the Great Commission as a church growth verse, one must conclude that the emphasis is on going to where the people are, not bringing them in. 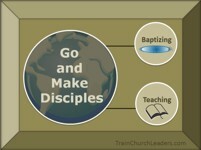 Obviously when we go and make disciples, one result will be them becoming a part of a local church. How good when the church grows as a result of true conversions to Jesus Christ! Church growth that results from having a large group of young adults naturally reproducing is not Great Commission growth. People transferring in from other churches because they like your worship style or pastoral staff better or because they had a bad experience at their old church, is not Great Commission growth. Are you relying on big outreach events to motivate people to invite people or on members obeying Jesus’ Great Commission? The reason for growing the church is not to increase attendance or to be a mega-church. Our primary focus must be on making disciples who love the Lord with all of who they are and who also love others. Honestly, what is at the core of your desire for church growth? We want to impact the lives of those in our neighborhood, our city, our county. We want to see the unchurched come through our doors. A growing church must not stop there. A growing church must also be a sending church. Jesus said, “you will be my witnesses in Jerusalem, and in all Judea and Samaria, and to the ends of the earth” (Acts 1:8). If church growth is about more than the number attending “your” church, you will desire to take the Gospel to places from which you or your church will not personally benefit. You will be working with other churches, even in far away places, to help them grow their churches with followers of Jesus Christ. Do you have a big picture perspective of God’s desire that none should perish (2 Pet. 3:9)? 5) If using the Great Commission as a church growth verse, one must acknowledge that it is about making fully devoted followers of Jesus, not merely increasing your numbers. “baptizing them …” – This is growing the church with people who are willing to identify with Jesus. “teaching them to obey everything …” – This is growing the church with people who not only say “I believe” but who yield to Jesus as Lord of their lives in all they do. As you look at the message you are teaching, are you staying true to God’s intent to be Lord of all, or are you candy coating the truth to pull people in, watering down or compromising to be more appealing to people? 6) If using the Great Commission as a church growth verse, one must recognize the true power Source of growing the Church. If your church is growing, to what or to whom are you crediting that growth? This entry was posted in Church Growth and Health .